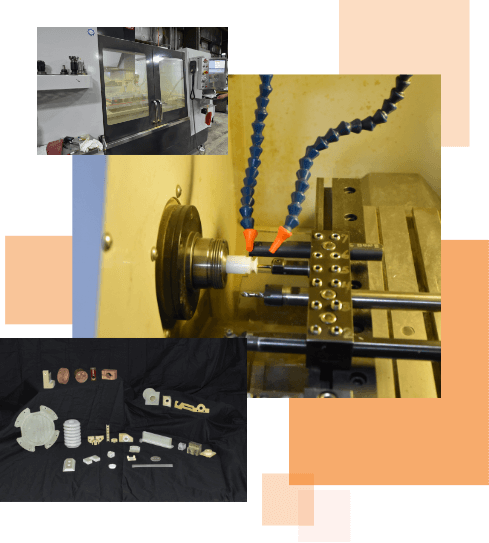 K&E Plastics is an industrial contract manufacturer for custom plastic machined parts located in Bennington, Vermont. Although they boast over 50 years of experience, they’re outdated website lessened the perception of their expertise, inaccurately communicated their capabilities, and made them digitally invisible on search engines. A new manufacturing company website was key to outpacing their competitors. This case study explores our web development strategy ensuring K&E Plastics not only received the best manufacturing website possible, but one that continues to provide them value through sustainable online lead generation. 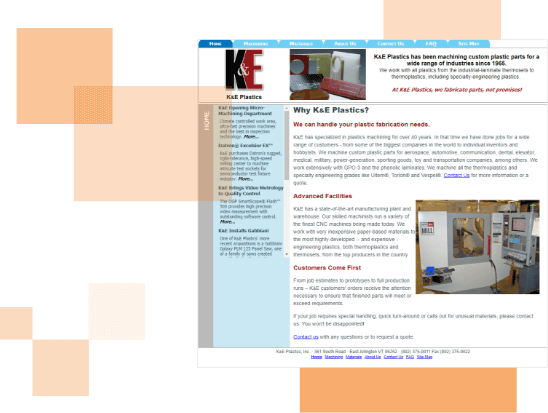 Without a new manufacturing website design, K&E Plastics would have continued to be virtually invisible to customers searching for their service online. The site’s confusing navigation also prevented visitors from finding important information about their services and even made it seem that their equipment was for sale. Combined with uncompelling content and a lack of a value proposition, their website wasn’t providing value beyond that of an old brochure. What they needed was an affordable custom website design that would consistently get their brand in front of the users searching for their services with a high degree of urgency. 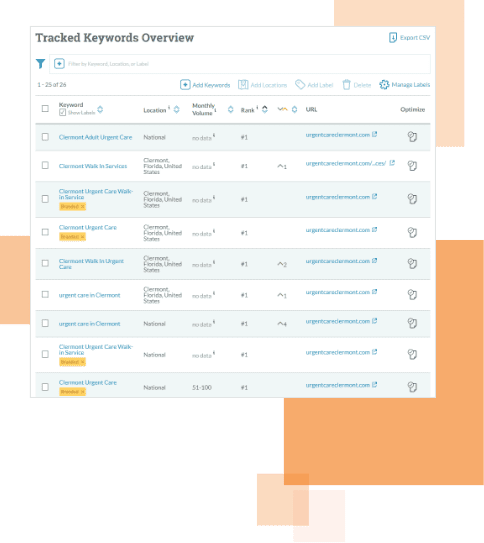 SEO-Targeted Site Structure & Content | Valuable, keyword-specific content pages, URL structure, and internal linking pattern to achieve top rankings on search engines results pages. Clear Navigation & Compelling Content | New, user-friendly menu helps users quickly navigate site; combined with value-driven service descriptions and persuasive copy that drives action. Responsive Website Design | New responsive web design that fits desktop computer screens and adapts to mobile phones and tablets, without sacrificing core site functionality. Lead Generation | Well-crafted lead generation points motivate a high percentage of visitors to connect with K&E Plastics that otherwise would never have found them. By drafting a website architecture focused on search engine optimized content, K&E Plastics would be able to rank above their competitors on search results pages. In combination with targeting key terms that drove high-value leads to their site, easy menu navigation, and compelling content, K&E soon attained more value from the Internet than they originally thought possible. 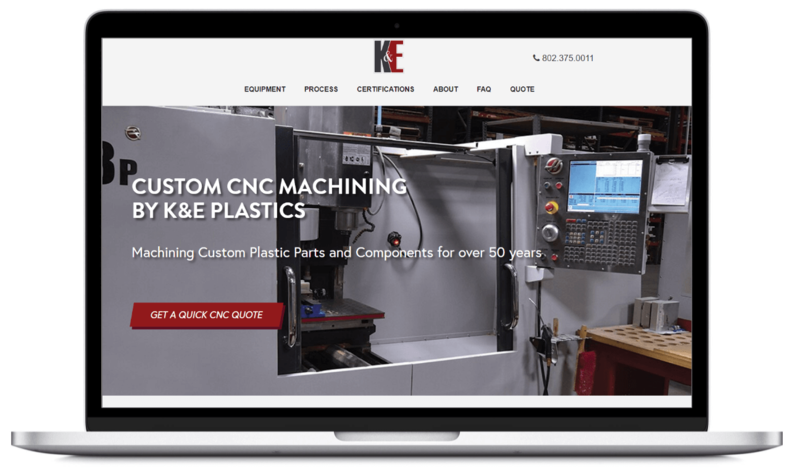 After launching their new website, K&E Plastics dominated search result pages in Q2, driving hundreds of new visitors to their site compared to their old site in Q1 2018. New, easy-to-use navigation and action-driven content reduced the rate at which organic search visitors left without viewing other pages on the site, Q1 vs. Q3 2018. The new mobile-friendly, responsive web design and easy navigation more than doubled the time visitors using mobile devices spent exploring K&E’s website, Q1 vs. Q2 2018. Compared to 0 from their old site, the new website averaged more than 4 bonafide leads per month from businesses who never interacted with K&E Plastics before.